Features solid ebony body with pure silver inlay and boron cantilever and Micro HD stylus. 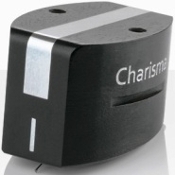 Please refer to our Clearaudio Phono Cartridges Product Information page for complete specifications for this model. Free shipping on orders going to addresses in the USA. COMBINE THE PURCHASE OF THIS PHONO CARTRIDGE WITH THE PURCHASE OF ANY CLEARAUDIO TURNTABLE, PHONO STAGE, OR TONEARM AND RECEIVE A SUBSTANTIAL DISCOUNT. PLEASE CALL FOR DETAILS ON THIS PROGRAM.